Let the games begin! 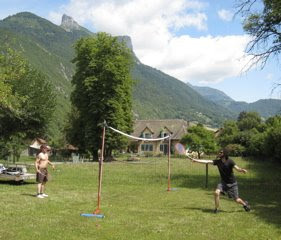 The Chanticleer Summer Olympics, inaugurated last year on tour in France ( during the real ones in Beijing) today included ping pong, badminton, cycling, swimming, and petanque ( a new event.) They usually take place at rest stops on the autoroute, so this was a more magnificent setting than usual. The bike path around Lake Annecy is spectacularly beautiful - the most frequented bike path in Europe - and offers the chance to swim in the lake.